I’m obsessed with making these cheesecake cakes. And it was only necessary to make an eggnog version. With a homemade spice cake. And eggnog buttercream frosting. This cake is creamy, and spicy, and just plain delicious. I wish you all could have a little taste! Of course my daughter is one who looks forward to swimming twice a day, even if I were to try and coax her into skipping, she’d never go for it! Not even if I tried to coax her with cake, cupcakes, fudge…she likes to swim. Well, with one mouth out of the house that means more cake for me! 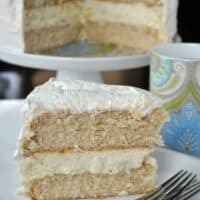 Anyone who has made cheesecake and layer cakes separately can make a cheesecake cake! 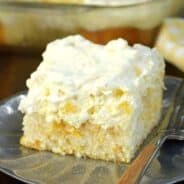 The biggest difference between regular cheesecake and the cheesecake used in my favorite cheesecake cake recipes is that there is no crust on the bottom of the cheesecake. The bottom cake layer is your “crust” here! When I make this Egg Nog Cheesecake Cake, I like to make the cheesecake first. It bakes at a lower temperature, so it is easier to increase the oven temperature for the cake after the cheesecake is done than vice versa. Let the cheesecake layer chill in the freezer for at least 2 hours before assembling the cake. Keeping it nice and cold keeps the cheesecake from getting too soft while frosting the cheesecake cake. Do you have any crazy plans over the holidays?? Here are some other Cheesecake Creations…enjoy! 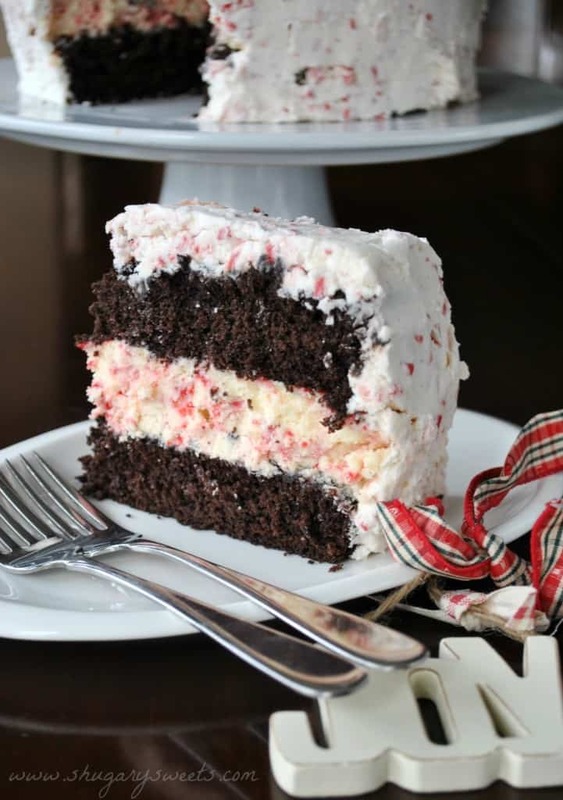 Chocolate Peppermint Cheesecake Cake– two layers of chocolate cake with a creamy layer of peppermint cheesecake, topped with peppermint buttercream! 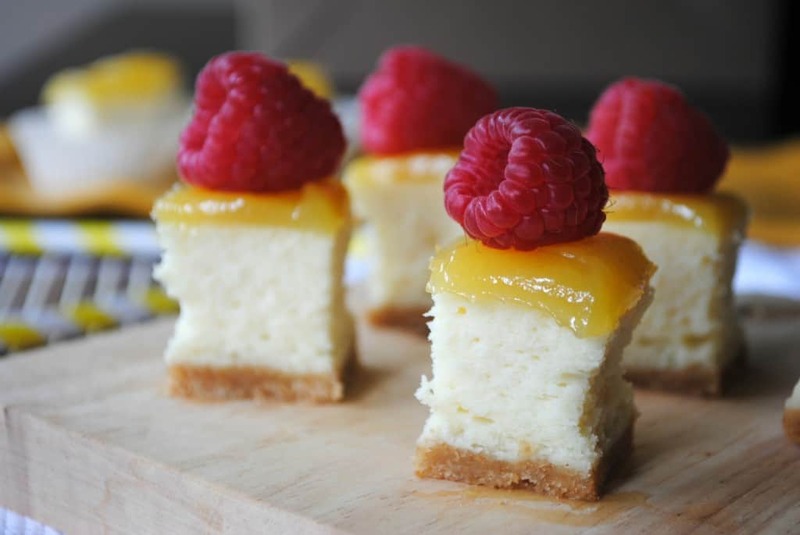 Lemon Raspberry Cheesecake Bites– creamy cheesecake with a vanilla wafer crust topped with lemon curd and fresh raspberries! Pumpkin Cheesecake Cake– perfect pumpkin cake layered around a creamy cheesecake center, topped with cream cheese frosting! 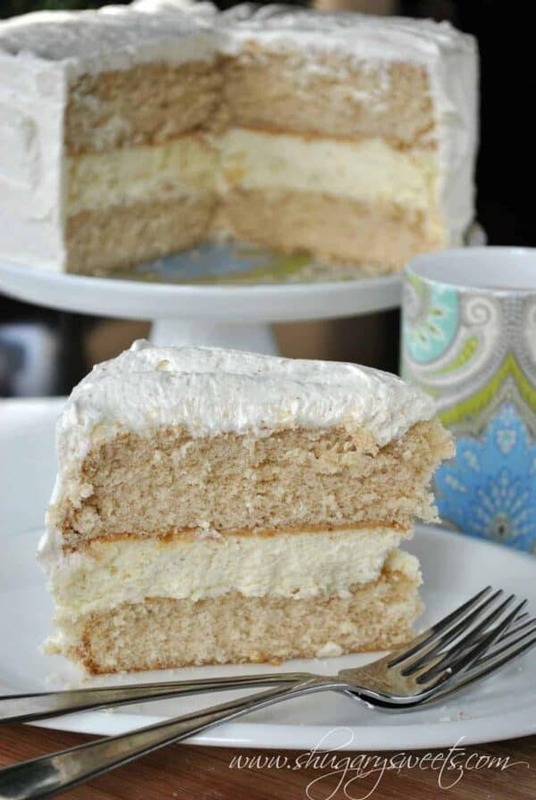 Layers of homemade spice cake with a creamy egg nog cheesecake filling and egg nog frosting! In mixing bowl, beat butter and sugar until creamy, about 2-3 minutes. Add in dry ingredients and mix until combined. Slowly add in egg white mixture. Beat in remaining buttermilk. Preheat oven to 325 degree. Using a large roasting pan on the lower 1/3 of the oven, preheat the pan. Prepare springform pan by wrapping bottom of pan (outside) with double layer of foil. Spray pan with nonstick baking spray and line bottom (inside) with a circle of parchment paper. Meanwhile, boil several cups of water to use later. Beat cream cheese with sugar for 2-3 minutes until creamy. Add in salt and egg, one at a time, beating well after each addition. Beat in sour cream, heavy cream and remaining ingredients.Pour into prepared 9inch springform pan. 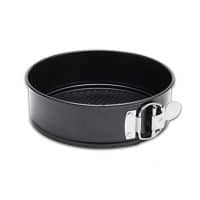 Place pan in center of preheated roasting pan. Pour boiling water, slowly, into pan, utnil about one inch of water comes up the sides. Bake cheesecake for 45 minutes. Turn oven off and let cheesecake sit for an additional 30 minutes in oven. Remove and cool completely. When cooled remove from springform pan and place in freezer for one hour, or overnight until ready to assemble cake. Beat butter for 3 minutes until fluffy. Add in nutmeg, rum flavoring, powdered sugar and eggnog. Beat for an additional 3-5 minutes until fluffy. Lay one spice cake on cake plate. Top with cheesecake then second layer of spice cake. Frost with eggnog frosting! ENJOY! Aimee such a gorgeous cake! I love how light and fluffy the cake itself looks. And then that filling. Come to mama! And them rum extract in the frosting? omg. Pinning! Your cheesecake cakes are ridiculous!! In a good way, or course. I can’t decide which looks more scrumptious, this one or the pumpkin one. Yum!! This cake is fantastic, Aimee! I love your cheesecake cakes. Not only are they impressive, they are gorgeous and look so scrumptious too! This version is no exception–a spice cake from scratch? Look how perfect it looks!! And that cheesecake center–swoon. Thank you Hayley!! Wish I could share this cake with you! Mmmm, spice cake! Egg nog frosting is such a perfect frosting! That’s an impressive cake! OH man, I have never made a homemade spice cake, but that mixed with eggnog cheesecake and frosting sounds like an amazing combo! Your cakes are simply gorgeous, Aimee! An eggnog version is just perfection–love this! And with the homemade spice cake?!?! OMG. Thanks Ashley! they are fun to make (and eat)! Aimee, I could easily obsess on this cake! Love the lush layers and the flavors say holiday… All of your works are lovely. Happy Holidays to you & yours! Thank you! Happy Holidays right back at ya! That eggnog cheesecake looks fantastic! Delicious. Come and visit us this week. We are having a wonderful giveaway from a talented Southern author. Aimee, this looks amazing! I haven’t attempted one of these cakes before but looking at yours it makes me want one NOW! 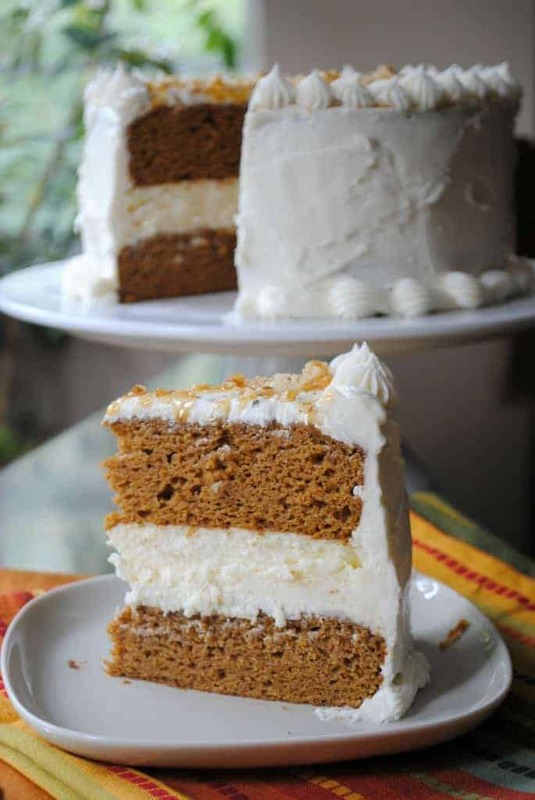 I love spice cake too….and with an egg nog cheesecake and frosting….OMG! I think you’re going to have to try this one! I knew it was coming! OH this looks amazing!!! And, twice a day? Geez. Jordan loves swimming, is good enough to join a team (my husband swam on teams when he was a kid) but she never had the drive to commit to it. And…I’m sort of glad hearing that, lol! Yeah, I had no idea what I was getting into with swimming. But, she loves it, hard to go back now!! Cheesecake sounds just wonderful! And the cake looks snowy and just delicious! Ok I’m sold! This looks amazing! I need to make these cheesecake cakes… Definitely thinking this will be my Christmas dessert!! Yum! YES you need to try them! Quite a few steps, but totally worth it. You take the first bite and KNOW this was worth the effort! Yum!!! I seriously just posted an eggnog cheesecake and now this is really upped the anty on that! This looks unreal! What a great looking cake! I wish I could have a taste as well. This recipe is definitely going on my to do baking list. omg, I seriously want to stick my face in this cake. It looks amazing. Go ahead. I won’t tell. This cake is so fabulous! Yum! These cakes are seriously the prettiest. I love the thick layer of cheesecake in the middle. Mile high and stocked full of delicious-ness. Can’t ask for much more than that. And I love the festive eggnog twist you gave this recipe! Thank you Elaine, It’s such a delicious cake. Mile high for sure!! My life needs more cheesecake in it; that’s for sure. I’m SO glad I stumbled upon your interpretation of the cheesecake cake! I used another recipe last week and it didn’t instruct me to freeze the cake prior to assembly. That would have made my life much easier! Can’t wait to try it again! Freezing totally helps. Just bring it to room temp (or fridge temp) before serving!!! Can you refrigerate the cheesecake overnight instead of freezing it? I think I’ve died and gone to cheesecake heaven, here! These look lucious…wondering if any variation for high alltitude for egg nog muffins? This sounds insanely perfect. In every way possible. I need to have a party or something just so that I can make something like this! Just found your site via Lil Luna….Love everything. You are very talented. Yay, glad you found me!!! Thanks for the sweet words. Can I just say, I CAN’T WAIT TO TRY THIS RECIPE and my hubby LOVES eggnog! I will say, I was confused by the cup measurement for the butter (who puts butter into measuring cups?? ), but then I remembered that cup measurements are usually written on the wrappers! Do you think this frosting could be piped? Thank so much for sharing your recipe. Sounds amazing! If you add a little more powdered sugar to the right piping consistency, absolutely! The recipe above is just a little too thin. 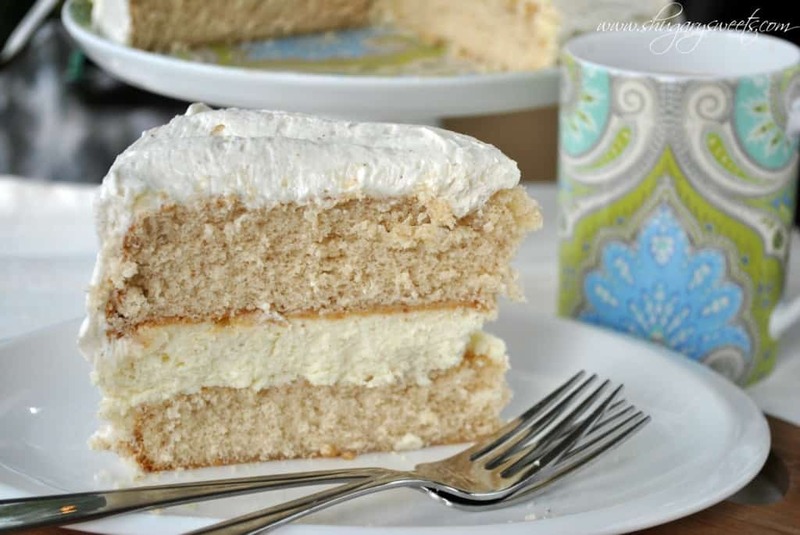 Could you use a box spice cake for this recipe to save time? 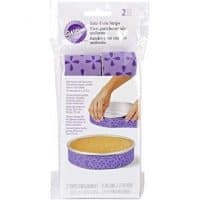 For the eggnog cheesecake cake what size pans do you use? 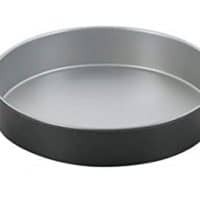 what size pans for the cake??? two round?? Mine are 8 1/2 inch round cake pans. ENJOY. Looks yum! I too would like to know what size pans you used. 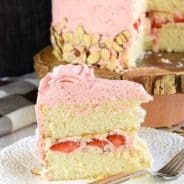 Is the cake recipe for both cakes or is that per cake? hello, can somebody tell me, what does pkg means? , please. Thanks so much for this wonderful recipe/idea! !- I added eggnog to the cake batter, the cheesecake batter and used my own buttercream recipe and substituted eggnog for some of the milk. 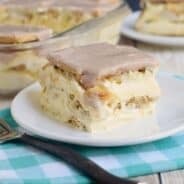 The white cake with the spices is lovely and the cheesecake filling is amazing! one of my friends dubbed it “turducken” cake!! This is a gorgeous stately cake for a holiday table! Can salted butter be used instead of unsalted butter? I’m a baking novice and I have only salted butter on hand right now. I made this for Christmas night. It’s a good thing I started the day before…with all the holiday commotion it took longer to get around to finishing than it should have. I individually wrapped the cakes and the cheesecake in plastic wrap. The next day I made the frosting and assembled the cake. This was a HUGE hit. It is so moist, fresh, creamy. Six people went through 3/4 of the cake that night. Next day I think a couple of people finished it for breakfast. It is well worth the effort and makes a great presentation. Hi did u put caked in freezer or fridge? I’m not the brightest bulb on the Christmas tree, so I have to ask. For the cake portion do the ingredients listed get mixed and divided into two pans or do I need to make two batches of batter for two cakes? Love all your recipes! I was wondering with regard to the eggnog cheesecake cake, do you whip the 5 egg whites prior to mixing them with the buttermilk? I have made this twice now. I love it! The second time I adjusted a few things. I thought the cake was a little dry so I added another egg white. And I added more spices to the cheesecake layer. This will be a staple for our holidays. Thank you! You’re welcome!! Thanks for the tips too! I found it dry too. Did the additional egg white help? Any other suggestions for moistening the cake? The first time I made the cake it looked like the picture. Nice clean slices-magazine perfect. The second time I made it with the additional egg white the cake was rich and moist. You could slice it, but it was crumbly. So, I guess next time I’ll have to pick presentation or taste. Yummy every time. There’s a piece in the fridge calling my name now. Good Luck! 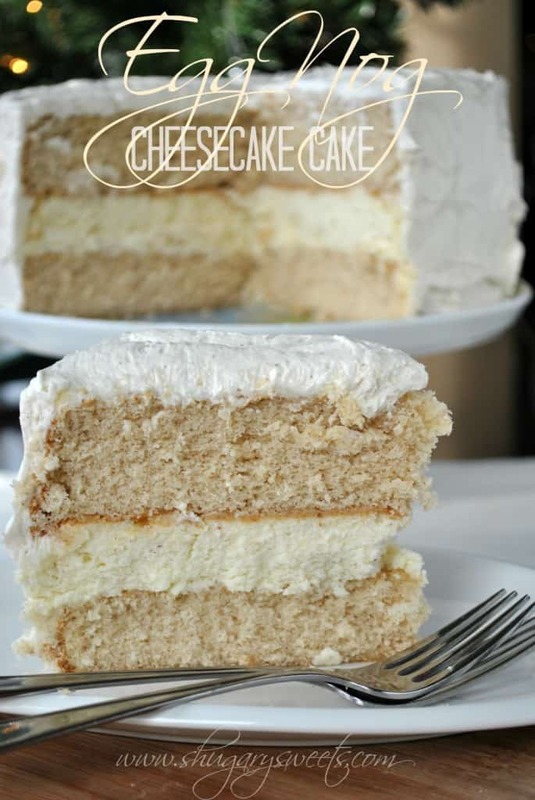 I love this idea of cheese cake and layer cake together! My goodness! I was wondering. No frosting to hold layers together? Do the layers stay attached when the cake s sliced? Love to hear from any of your fans. The layers stayed together well (the cheesecake pretty much glues the cakes together). Made this for Christmas Dinner and it was delicious! I really wanted to get the eggnog flavour so substituted it for the heavy cream and a splash of the buttermilk and it worked out well! So glad to hear you loved it 🙂 Thanks for your feedback. Merry Christmas! !